Oscar has two weeks left in his Kindergarten year. Looking back over the past 10 months, it’s incredible to see how much he has grown, how his skills have developed and friendships formed. One such friendship was with a sweet boy named Denny. Oscar was invited to Denny’s birthday party early in the school year and at that time, we had no idea that Denny was in remission from Cancer. We simply saw a beautiful boy with an open heart who wanted to be friends with our son. His parents wanted him to experience the things every child should like a bounce-house birthday party and we were happy to make a new friend. It was not uncommon to walk away from a conversation with Denny wearing a giant smile. He just had that effect on people. A few months later, were devastated to learn that not only did Denny’s Cancer return, but there was nothing that could be done to save his precious life. His last few months were spent celebrating every day with his family and staying as comfortable as possible. On his good days, he would come to school to learn, laugh and play with his friends. As parents, we had a grasp on how the next steps would unfold. But our children had no idea what was happening. One Sunday morning in April, I arrived at church early. Jerry was playing in the band that day and I dropped the boys off in their classes so I could take my seat. As I waited, I casually scrolled through Facebook and saw that Denny had passed away that morning. I started sobbing uncontrollably for this boy, his family and how unfair it all is. Things like this shouldn’t happen. Not to Denny. Not to anyone. When Jerry joined me after the musical set, we sat in the balcony crying together throughout the sermon. We decided to wait until Calvin’s nap time to tell Oscar about his friend to give him our full attention and also to give us some time to get ourselves together. We had absolutely no idea how to handle this. Oscar has never had to deal with death in his short life, and especially not someone with whom he shared so many memories. I shared our grief with a few friends privately, because while we loved Denny and knew him as Oscar’s classmate, we weren’t that close to the family and didn’t want to make his loss about us. My friend Erin offered to loan us her copy of the book My Yellow Balloon and I drove to her house to pick it up that night. When we broke the news to Oscar he was unsure how to deal with his feelings. We expected this and after speaking with other parents, we knew that what he was going through was very normal. He would burst into tears some moments and try to bring up the topic casually a few hours later. He needed time to process and we wanted to allow that. Denny’s passing was on a Sunday so the next day, it felt odd but necessary to send Oscar to school. He was understandably anxious about it. I decided it would be a good time to read the book so we sat down and read together. What I didn’t realize was how much I too, needed the simplicity of this beautiful story. 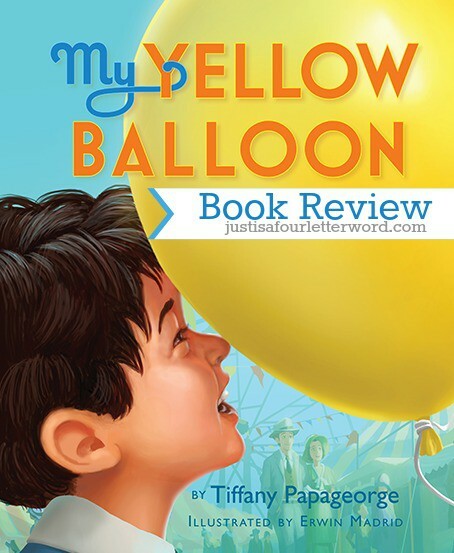 Tiffany Papageorge beautifully tells the tale of a boy and his favorite yellow balloon, which ultimately floats away. He must deal with emotions like sadness, anger, and complacency as he tries to find his way again. At first he doesn’t want to do anything and as time goes on, he learns to remember the balloon in a way that makes him smile instead of filling him with sadness. In the week following Denny’s death, the school did an incredible job of letting the children work through their own feelings of loss. They drew pictures, spoke with a counselor and Denny’s family even gave a toy from Denny’s own collection to each child as a memento. Oscar sleeps with his Darth Vader Denny bear every night. It’s been over a month and I was unsure if I would ever write about this out of respect to Denny’s family. But then I received an email asking me if I would like to review a book called My Yellow Balloon and the timing was too right. This book helped us so much and I truly want to share it so other parents who may be faced with this impossible conversation can have a valuable resource if and when they need it. No one wants to have this conversation. But if and when the time comes, it’s so helpful to draw on a resource like My Yellow Balloon. You may notice that I decided to use affiliate links in this post. Please know that if you decide to purchase My Yellow Balloon through my link, all proceeds will be donated to the NC Lineberger Comprehensive Cancer Center – Pediatrics Cancer fund. I received a copy of My Yellow Balloon for the purpose of this review. Thanks so much to my friend Erin for loaning us her copy and to Tiffany Papageorge for helping us through one of the hardest conversations we have ever had as parents. Such a tough conversation and I’m so glad you shared this so that we can keep it bookmarked in case we ever need it. I’m so sorry for his family and for Oscar-that has to be hard at his tender age.